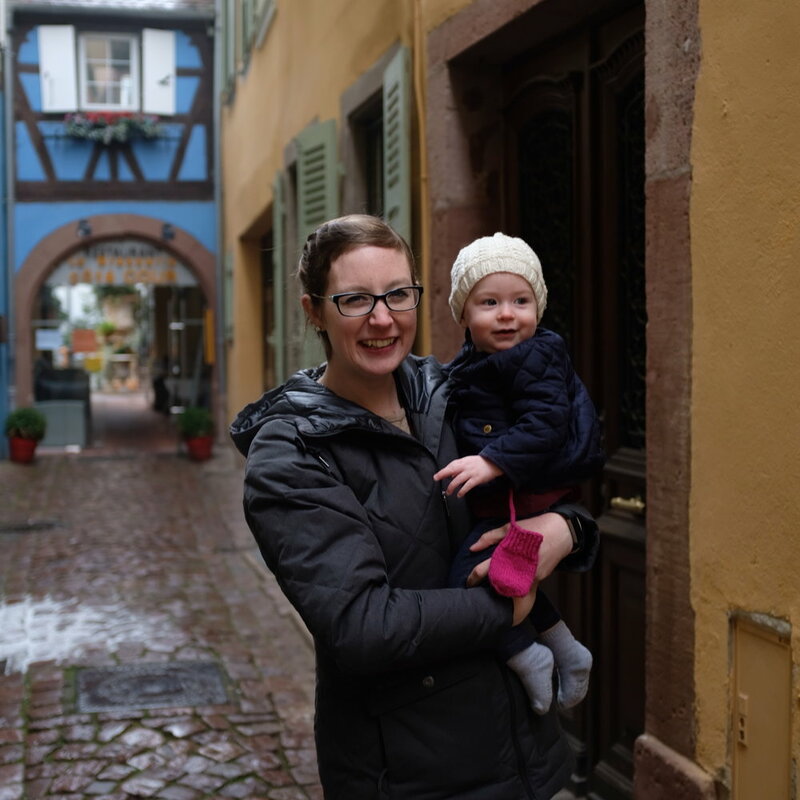 Welcome back to the second installment of the Euro Baby Chronicles. I can promise a continuation of our lengthy recap that may or may not stretch into a THIRD post. I guess we'll find out after I type for awhile longer. Where did we leave off? Oh yes. The passport was recovered, dinner was delicious, and we had turned in for the night. We had a nice comfy bed and a lovely view overlooking the street in a charming hotel, although it turned out that the other half of our traveling party had issues with their shower. Sad times! I think the hotel made up for it with their delicious breakfast offerings though. Elise sampled a croissant and I ate another two myself, coupled with yet another hot chocolate. When in Rome, you know? Or better said...when in Paris, you know? 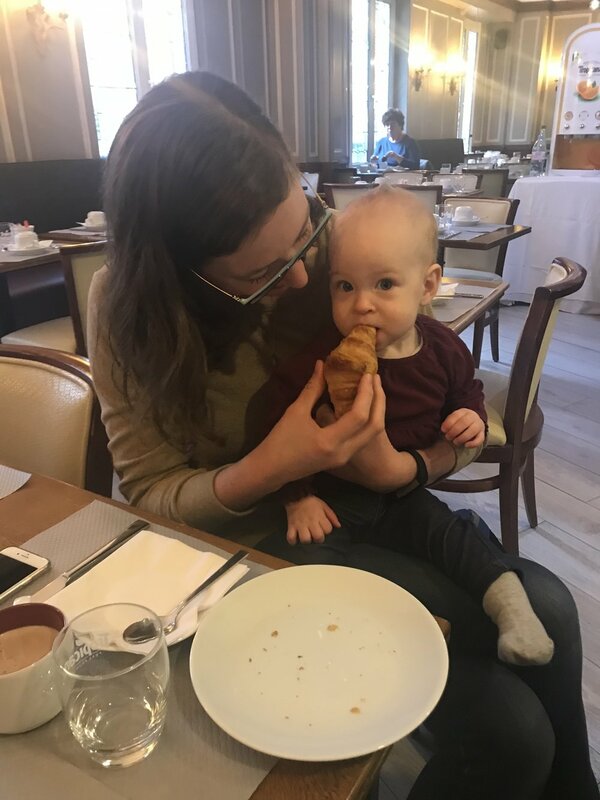 After enjoying her croissant, Elise spent a couple of extra minutes hanging out with Rachael while I went on a quick mission to buy some diapers from the nearby market. Turned out they were quasi-closed - they informed me I needed to leave after I walked through the very much unlocked door - but Elise clearly loved her quality time. Upon my return, we squashed all of us and our various suitcases, bags, and the recently-delivered stroller (!) into an Uber and sped across town to the Gare de l'Est train station to ride toward Colmar. Colmar is a tiny town in the Alsace region on the eastern border of France (wine country! ), and if you want a visual, picture a village straight out of Beauty and the Beast and you'll be right on the money. 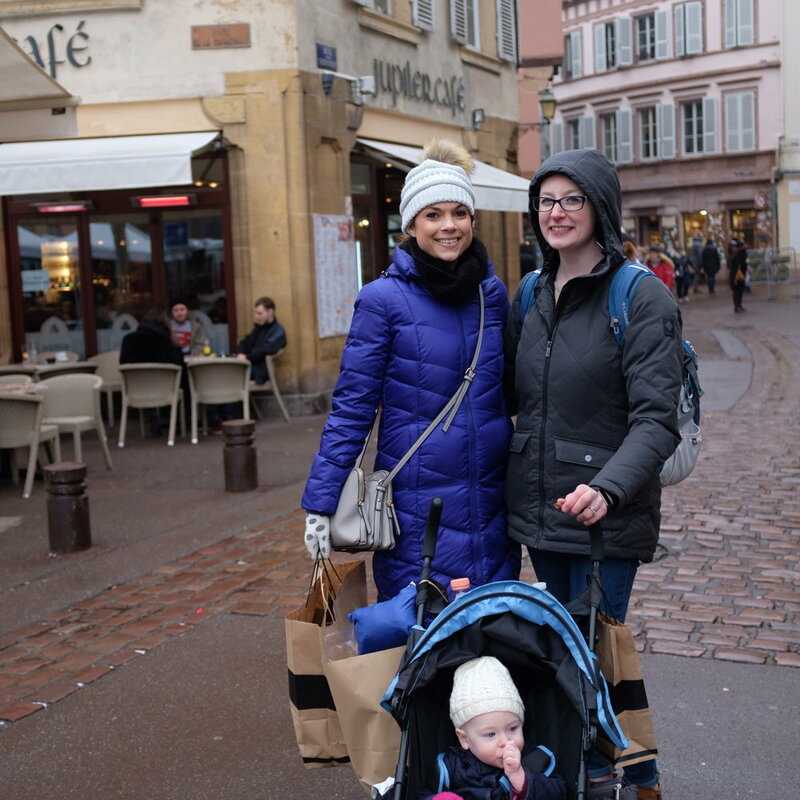 We also had all of our bags since we were going to end up in Basel, but Google had informed us that the bike shop next door would stow luggage for the day for a mere two Euro per item. Great news! The downside? The bike shop was closed for lunch, and would not reopen for two hours. The upside? The train station had a little restaurant. We camped out, drank some hot drinks, and waited until the bike shop employees had finished their afternoon lunch + siesta. After walking so many miles in the previous two days, I don't think any of us were sad about the forced break. When the appointed hour came, we dropped off the luggage and made our way into town on foot. It was as charming as ever and as lovely as I had remembered from my first time there, albeit much chillier. We found a sandwich shop for lunch and then proceeded to walk around town, stopping in shops where we wanted to investigate items we'd seen in the window and taking all sorts of pictures of our surroundings along the way. There were two places to note in particular: first, we found French Target. Monoprix has everything from diapers and wipes (thank goodness - I had just used up my very last one from home) to food to housewares to clothing, and all of it was adorable. Elise got a souvenir from here, because it's an unspoken yet widely acknowledged rule that you can't pass through Target/Monoprix and leave empty-handed. I should add that I found the French generic-brand diapers to be significantly superior to Pampers. I'm still working on trying to get a subscription service sent to my house directly from Monoprix. 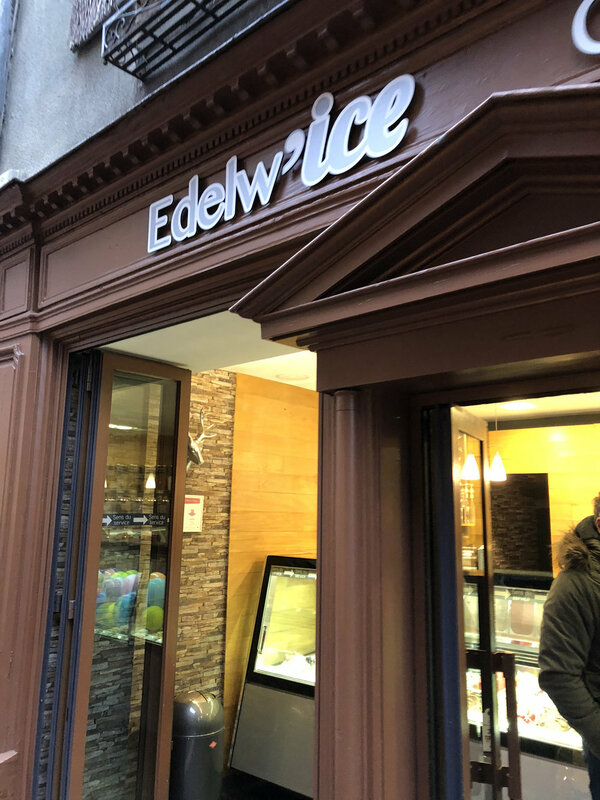 Second, we found an ice cream shop called Edelw'ice. Let's pause for a moment to really appreciate the greatness of that pun. After laughing so hard, we needed a snack, so we hit up a nearby chocolate and pastry shop for our pick me up. 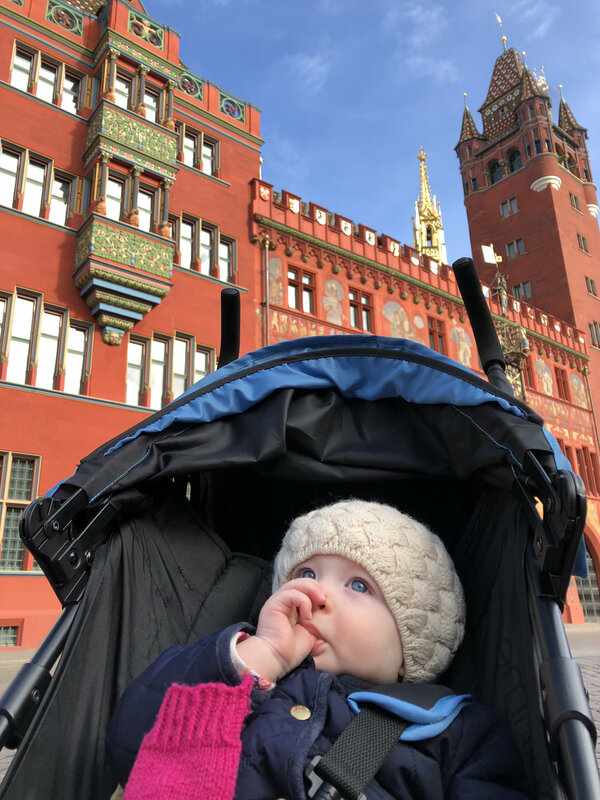 Elise was beyond delighted to be released from the constraints of her stroller, and she didn't hesitate to let the entire dining area know about her glee. Fortunately, the window distracted her enough that we were able to make it through our tea and (yet more) croissants without shattering any porcelain dishware, and we left with full bellies and slightly damaged eardrums. Back to the bike shop we trudged to pick up our luggage and hop on the train to Basel! Oh, and we gave up on the stroller for that last leg. Elise got the Ergo treatment instead. The half hour train ride was quite uneventful as Elise fell asleep the moment we got on board. After a very active day, I think I may have appreciated her nap even more than she did. She was a total traveling champ on this trip and I was so very proud of her. Look at how happy she was, even when she was pooped! She did have mittens...but she would just take them off approximately five seconds after I put them on. Every. Single. Time. The vibe of the trip changed a little bit once we got to Basel due to the change of purpose. I mean...my purpose was still the same, but Julie was heading back home, and Rachael was there on a business trip. Do you know who else was there for business? CHAZ! We overlapped with him for a grand total of two nights (he worked during the day, of course), and in that span of time we took zero pictures of us all together. Evidently our priorities were elsewhere - his with work and mine with eating carbs and sugar. Basel is definitely a city, but it's a much smaller, quieter city than a giant one like Paris. The effect of that change was that every single thing is closed on Sunday, and we had arrived on a Saturday night. Nevertheless, Elise and I rallied on Sunday morning, got ready for the day, and eventually went exploring after her morning nap. As a quick aside - it is logistically difficult to shower while being single-handedly responsible for tending to a baby in a hotel room. We tried several methods over the course of the week, but this one was the most successful. I figure she already knows how to appreciate a good spa treatment. Believe it or not, our 2.5 days of Basel exploits can be condensed into a few pictures and even fewer words: we came, we saw, and we ate. Success! We're actively working on raising the next generation of cathedral lovers. Chocolate was obviously an important factor for me, and being in the Land of Chocolate, I was determined to find the best hot chocolate place in the city and drink it. I'm happy to report that I did find it, and it was delectable. Really, you can't go wrong when you're at a place that's dedicated to hot chocolate drinks. It came with a small piece of the actual chocolate used in the drink, a heaping pile of whipped cream ON THE SIDE, and a small glass of water to wash down the decadence. While it was amazing and absolutely worth the effort of seeking it out and drinking it while holding a squirmy child, I'm about to make a bold, entirely subjective claim: I liked the Musée d'Orsay's hot chocolate better. There aren't very many things in life sweeter than a baby who cuddles in her sleep.